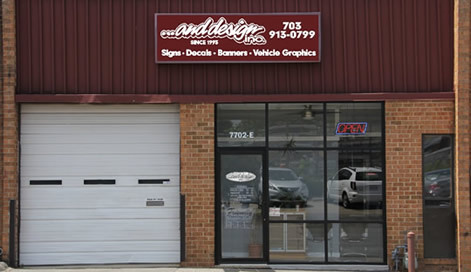 About Us - And Design Inc.
And Design Inc. is located in Springfield Virginia and has served Northern VA, MD, and the District of Columbia’s sign & graphics needs for 20 trusted years. Our experience in visual graphics & marketing enable us to provide our customers with a design oriented service, thus creating an image with a high visual impact. We take pride in our design talents and friendly, personal customer service. We look forward to working with you for all of your sign and graphics needs. And Design Inc. and operated.